Centrally located but very quiet and peaceful in the suite. Easy access to stores and transportation. Loved the pool and sundeck. The location was fabulous. Costanera Tower is just a 5 mins walk away. The Oasis cable car station to Cerro San Cristobal is about 15 mins walk away. Lots of restaurants in the vicinity. Staff was very jovial and helpful. Rooms were really clean and tidy. There's all cutlery available required for cooking a decent instant snack. Iron with iron board provided in each room. Overall a very comfortable experience. Comfortable bed, full kitchen facilities, super convenient for the metro, shopping and restaurants. Well-serviced. location and wifi is good, room is also fine. they can keep some kitchen towels and basic salt pepper and cooking oil. that will be a big help for travellers. WARNING, DO NOT STAY HERE! The experience was hell and we left the next morning. Read below for details. The studio flat was excellent. We could make our own breakfast, and a cup of tea whenever we wanted one. We enjoyed sitting on the balconey and having an evening drink. We also liked the roof top pool - amazing view from there! Internet connection was good. RENTASUITE trata-se de um prédio, que fica muito bem localizado no bairro de Providência, perto do metrô e muito fácil de se chegar. O prédio nada mais é do que um monte de flats, totalmente mobiliados, que você pode desfrutar da cozinha, piscina, etc, como se estivesse alugando um pequeno apartamento. Não conta com café da manhã, mas tem recepção 24hs, durante todos os dias da semana. Eu cheguei em pleno final de semana e durante a madrugada, mas na repecção estava um envelope contendo a chave do apartamento que eu iria ficar. Na segunda feira, em horario comercial, fui no apartamento 803 que é onde fica o escritório. Nesse escritório você acerta o pagamento, que pode ser feito em Dolar, Pesos Chilenos, ou Cartão de Crédito. 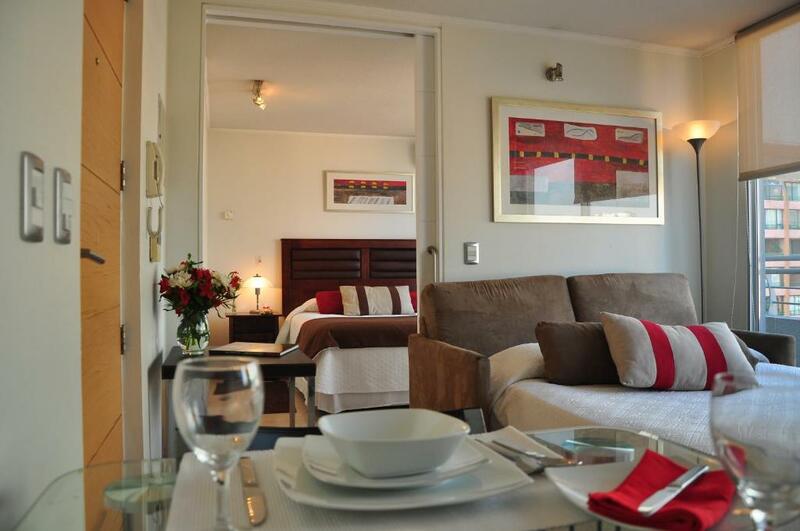 Lock in a great price for Departamentos Rent A Suite – rated 8.3 by recent guests! 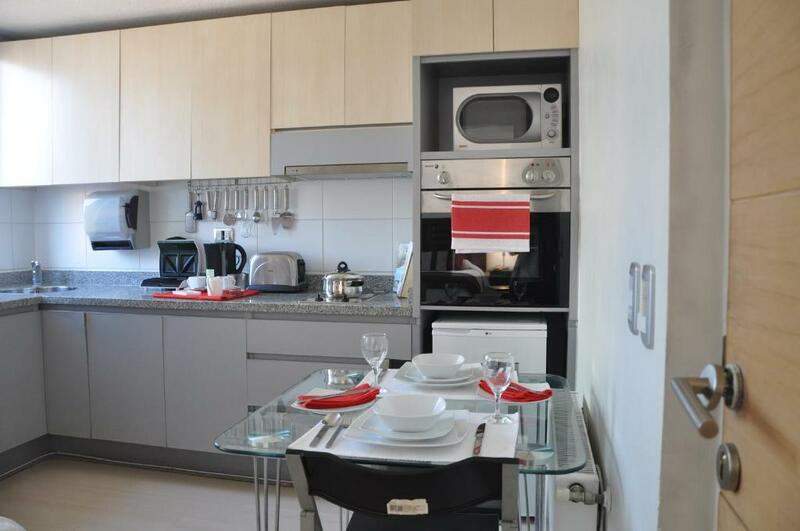 One of our top picks in Santiago.Spacious apartments with fully-equipped kitchens and a central location are highlights at Departamentos Rent a Suite. Located next to Los Leones Metro Station and just 2 blocks from the Costanera Center shopping center, the property offers a rooftop pool and a fitness center with panoramic views over Santiago, and easy airport access. 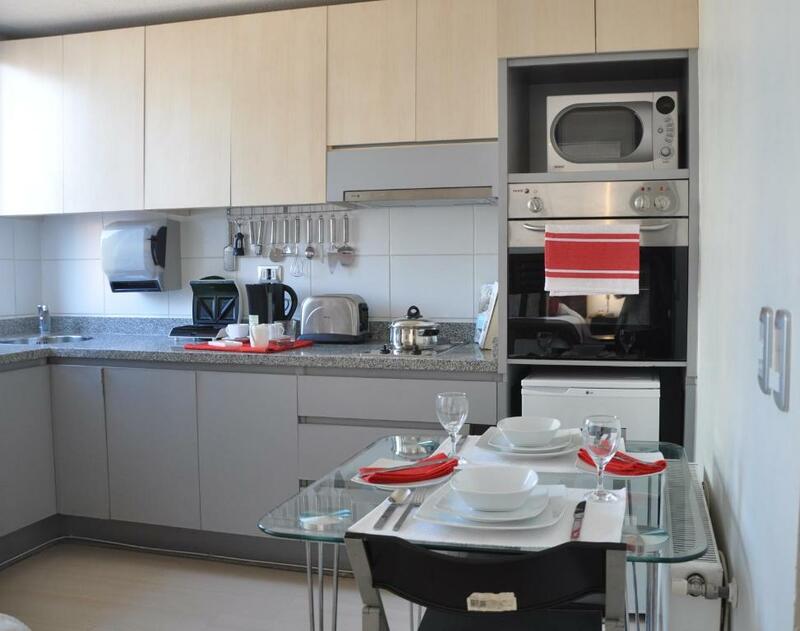 The modern apartments at Rent a Suite have fully-equipped kitchens with granite counters, a dining area, private bathroom facilities and balconies. Some units also feature a seating area. 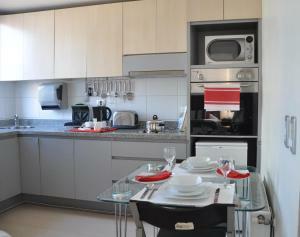 All units are equipped with air-conditioning and heating, as well as an LCD TV and a safety-deposit box. Free Wi-Fi is available in public areas, and wired Internet is provided in the rooms. Rent a Suite is 11 mi from Arturo Merino Benitez Airport, and 350 feet from Los Leones Metro Station. An airport shuttle service can be arranged at an extra fee. Parque Arauco Mall is a 15-minute drive away. Guests at Rent a Suite may request on site parking for an extra fee, upon request. Free local calls can be made. 뀐 Located in the top-rated area in Santiago, this property has an excellent location score of 9.4! When would you like to stay at Departamentos Rent A Suite? This modern studio apartment features a queen-size bed, a private bathroom, a fully-equipped kitchenette, a dining area and a balcony offering panoramic city views. The property is also fitted with a plasma TV, air-conditioning and heating. Free Wi-Fi is available in public areas, and wired Internet is provided in the rooms. Private parking is available on site (reservation is needed) and costs USD 14 per day. This one-bedroom apartment features a queen-size bed, a private bathroom, a fully-equipped kitchenette, a dining area, a seating area with a sofa bed, and a balcony offering panoramic city views. The property is also fitted with a plasma TV, air-conditioning and heating. This one-bedroom apartment features a queen-size bed, a private bathroom, a fully-equipped kitchenette, a dining area, a seating area, and a balcony offering panoramic city views. The property is also fitted with a plasma TV, air-conditioning and heating. Nuestro horario de atención en la oficina es de lunes a viernes de 09:00 a 17:30 ubicada en el mismo edificio. Después del horario indicado, sábados, domingos y festivos dejaremos a partir de las 14:00 hrs. en portería del edificio un sobre a nombre de la reserva con la llave del departamento asignado. Estamos ubicados en pleno corazón de Providencia, muy cercano a centro comercial Costanera Center, tiendas comerciales alrededor del edificio, cafeterías, restaurantes, supermercados y a media cuadra metro estación Los Leones. A un par de minutos puede ir al Cerro San Cristobal donde esta el ZOO y teleférico de Santiago La zona es bastante segura, eso si, hay que ser bastante precavido en centro comercial, metro, centro de santiago y tiendas, por los carteristas. Si anda atento y resguardando sus cosas, no tendrá ningún problema. House Rules Departamentos Rent A Suite takes special requests – add in the next step! Departamentos Rent A Suite accepts these cards and reserves the right to temporarily hold an amount prior to arrival. Please note that parking services are subject to availability. Outside these hours, on weekends and/or on holidays, guests will be able to find the keys to their accommodations in an envelope at the front desk. The envelope will be available as of 14:00. Email should be used for urgent contact. The rooms are just a little small. The view from the balcony that we booked was just the wall of the other building. However it seems like other rooms had a better view. Cercanía al metro, restaurant. Sector tranquilo. I arrived early in Santiago and expected to wait several hours until the apartment became available, a standard procedure which I accepted. However, for reasons that were not explained, as soon as I checked in, I was informed that the following day I would need to change apartments. This didn't bother me, although later I discovered that I again had to wait another 3 hours for it to become available. WARNING, DO NOT STAY HERE! Please understand my wife and I travel a lot, like 10 times a year minimum since 2013 and now we are travelling the world so every night is a night in accommodation. We stay in a variety of places, from hostels to the Edition Hotel in Istanbul, so we know quality but we are also comfortable in cheap accommodation thats rough around the edges. I have no problem paying 30 USD per night for an below average hostel in a particularly expensive city, or 250 USD per night for a premium hotel for a spa holiday. Everything is relative. As for Departamentos Rent A Suite - Santiago: This place is both horrible and over priced beyond your imagination. It's clear the photos are from the construction or rennovation over 10 years ago and that the rooms have not been properly cleaned or serviced in that entire time. We checked in late and were greeted to: - non functioning Aircon, upon looking in the back of the remote i saw that the batteries are completely rusted.... when was the last time someone stayed in here? - non functioning Wifi, if it wasnt for my 4G sim we couldnt have called booking.com for help - a tiny kitchen with one cutting knife which didnt match the big upgraded one with lots of utensils in the photo we paid an extra 300 EUR for - the whole apartment smelled of mould and cigarettes - the bed cover had stains on them, disgusting - my wife went to clean her face after our long day and the hot water tap for the sink just came off. Theres no hot water in the sink. - many of the power sockets didnt work - the walls were covered in scuff marks, the bathroom door with stains - the skirting was coming off, the corners behind the curtains looked like they hadnt been cleaned in years, honestly it was horrible This is no exaggeration, we have it on GoPro and many photos. We called booking. Door handle into suite and bathroom was loose.